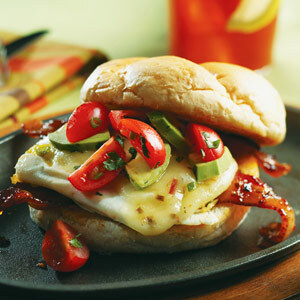 Even the heaviest morning traffic won’t phase you if you start the day with this spicy sandwich. With its spicy-sweet bacon and tomato-avocado salsa, its one of the best wake-up calls. Cook bacon in a nonstick skillet over medium heat until crisp. Remove bacon, pour off drippings, then add brown sugar, chipotle peppers, and vinegar to skillet. Return skillet to burner and simmer glaze over medium heat for 1 minute. Add bacon; turn strips to coat with glaze. Remove glazed bacon from skillet and keep it warm; wipe out skillet. Combine tomatoes, avocado, scallions, cilantro, mayonnaise, lime juice, and pepper for the salsa in a small bowl; set aside. Cook eggs in butter in same nonstick skillet over medium heat until whites are set. Season with pepper. Break yolks, flip eggs, and cook another minute. Top eggs with cheese; cover skillet for 1 minute to melt cheese. Arrange two strips of bacon on bottom of each kaiser roll. Add cheese-topped egg, salsa, and top of kaiser rolls. Return cooked bacon to skillet and turn to coat with the brown sugar-chipotle glaze. Squeeze lime juice over salsa ingredients to keep avocado from turning brown. Cook eggs, pierce yolks, then flip eggs over. Top with cheese, and cover skillet to melt the cheese.